This Sunday will be our 6th (??) annual Barn Bash at the farm. Friends, family, and Wetherbrooke Farm students/employees/family are invited. The party will begin at 4pm with games, a pinata, and other outdoor fun. At 5:30 we will begin dinner, pony rides, hay rides, and a fishing derby. At around 7pm, “The Back Forty Blues Band” will be playing great tunes for us while we sit around the bonfire consuming smores like they are going out of style. What to wear, what to wear????? Western attire is required. Dust off your cowboy/cowgirl boots and pull on your Wranglers. No city slickers allowed. Please bring chairs or blankets to sit on, a dessert or side dish to share, and beverages. We will be holding our famous “stickhorse steeplechase” at the closing of the evening. Please bring a stickhorse if you have one (and put your name on it somewhere). We look forward to a funfilled evening with friends and family! Hope to see you all there! 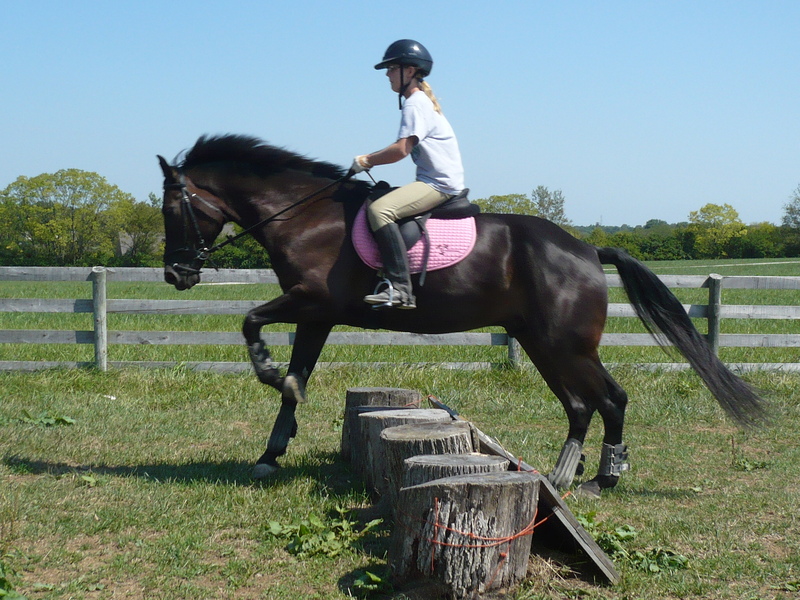 Last jumping lesson before KY Classique….. This morning I woke up at 5:30am to get Gus ready for his 9am jumping lesson in Lexington. It was really hard to get up this morning, and I can feel the exhaustion from the month of craziness starting to set in. I grabbed a fruit parfait and a huge Coke at some McDonalds along 75 south, and I reached the farm by 8:30. Elissa met me at the trailer to tell me we’d be in the grass today, so I started the process by putting in my studs. Gus seemed to be just a bit too sweaty after getting out of the trailer, and I went ahead and took his temperature. Since the beginning of our little grain scare over the weekend, Dr. Yates has had me taking his temperature daily. His temperature was just a few tenths above his normal, which I attributed to the hot trailer ride. He hadn’t been coughing at all this morning, so I was feeling pretty good about him. The lesson couldn’t have gone any better. 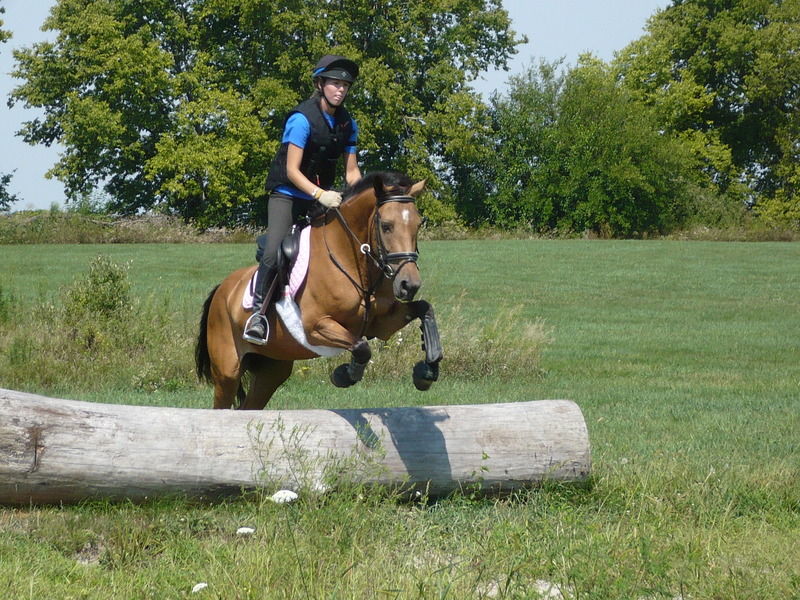 After we warmed up, she had us jump a stadium course of intermediate and advanced height fences out in the grass. Gus jumped the combinations perfectly, and although I let him drift left a few times, he never touched a rail. We jumped our course twice and ended with that. We discussed a few details about the upcoming weekend and about the training and medication schedules leading up to the show. I took out Gus’s studs, hosed him off, and put him back in the trailer. A new pony was being delivered to our place at 9:30am this morning, and I was looking forward to getting back to see him. On the drive home I found out that our hay was going to get cut on Tuesday and baled Thursday. Maybe I was just a little tiny bit glad that I was going to be out of town on Thursday???? Is that wrong??? Dave Jones was at the barn when I got home. He did Gus’s feet for the last time before the show. He told me not to worry about a thing because he had put new “anti-gravity shoes” on the fronts. Perfect, I thought! 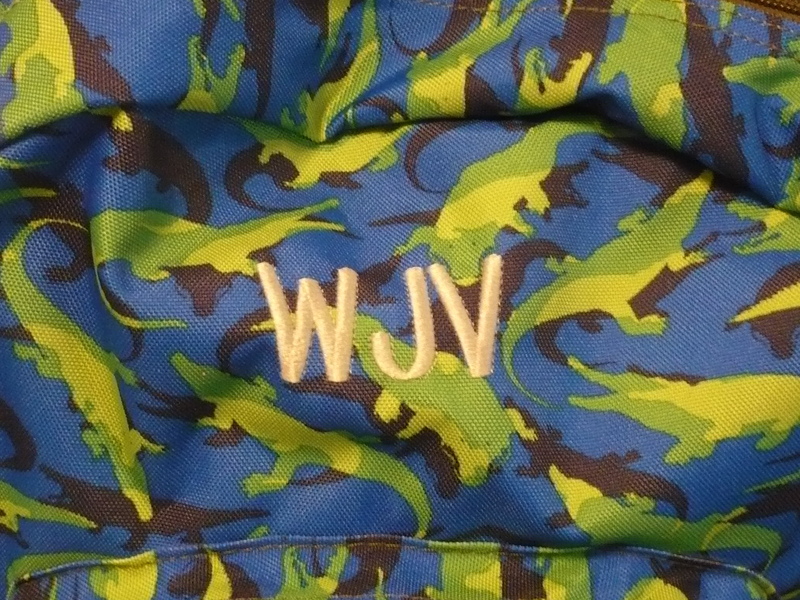 I asked him if he could also put a turbo booster or jet pack on the back. Dr. Yates was out at 2pm to give Gus a respiratory examination. His lungs were clear, and although he was not thrilled about the horrible grain we had received, he wasn’t too worry about it health wise. He looked at a sample of it and thought that it could have contributed to his coughing due to the dustiness and decomposition of the grain from what looked like weevils. His temperature remained a few tenths higher than normal, but as long as the trend doesn’t continue he wasn’t worried. Good to hear. We are about as ready as we are going to be. This will probably be my last “Gus” entry until the weekend, and I am starting to look forward to seeing my xc course on Thursday! Lesson Monday. Took Kate to King’s Island Monday afternoon. 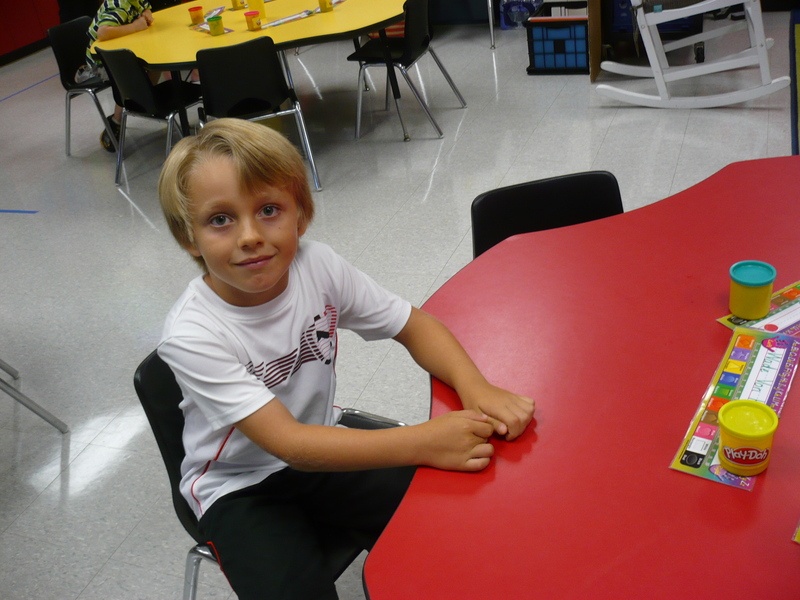 Kindergarten open house Monday night. Tuesday Kate started school. Tuesday night both kids had soccer. Wednesday we went horse hunting. Wednesday evening was Dr. Miller’s viewing. Wednesday night Wade had a scrimmage. Gregg Neumann came to work on Gus Thursday. Thursday afternoon I took Wade to King’s Island. Thursday evening Kate had Open House. Both had soccer practice Thursday night. Friday Wade had his first day of Kindergarten. Friday afternoon Dr. McFadden came to give Gus his Adequan injection. Saturday we had 3 soccer games. Elizabeth’s 21st birthday party was late afternoon. I went pony shopping Saturday evening. Sunday we have church and 2 soccer games. 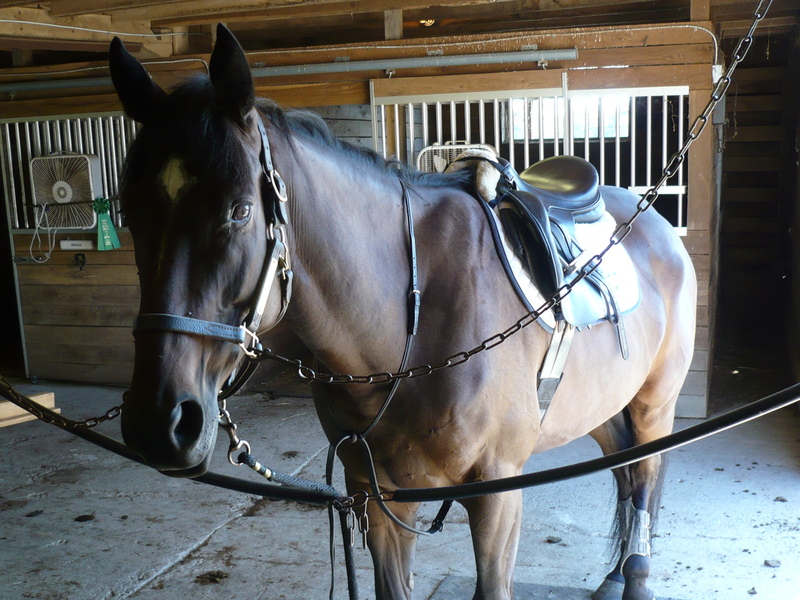 Oh…..new lesson pony arrives Monday morning at 9:30am—in time for the farrier. As far as the horses go…..
Gus is doing well, but he has had a little cough over the last couple of days—I believe it is directly related to the bad batch of dusty grain we received earlier this week. I have one last jumping lesson in Lexington on Monday, and then will meet the vet for one last check before I leave for Kentucky on Thursday. Ride times have been posted, and I’m looking forward to getting this under my belt! By this time next week I will be done with the show and looking forward to trying a one star in Virginia in November. McKinley is coming along. 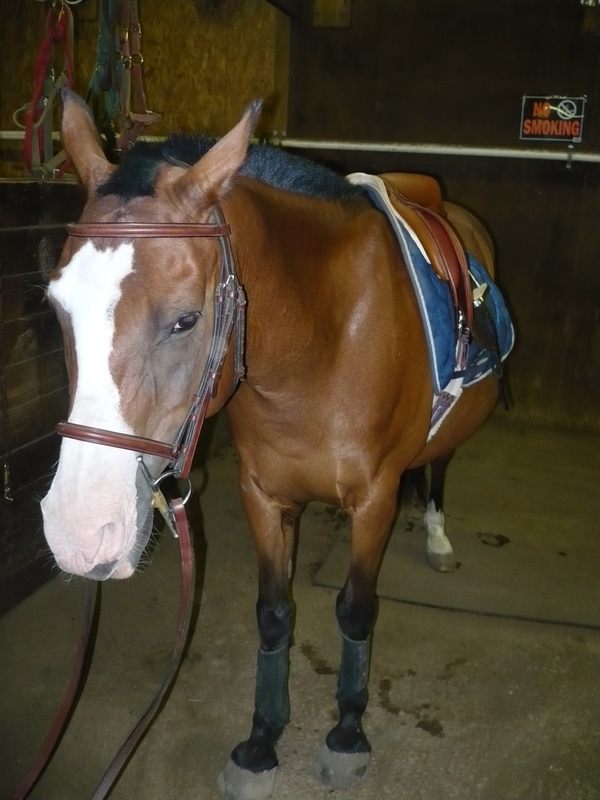 His dressage is getting better, and I hope to spend more time with him very soon. Last night we attended the kindergarten open house at Wade’s new school. 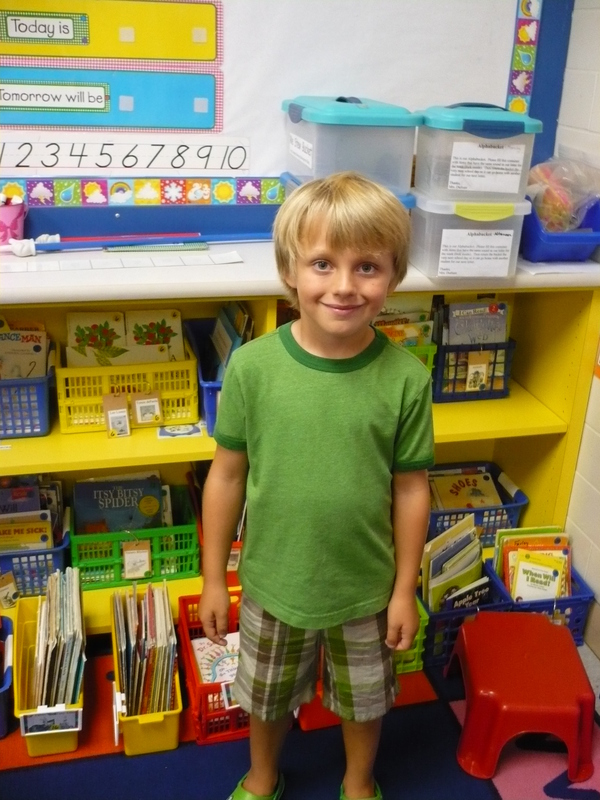 He got to meet his teacher and several of is fellow classmates. 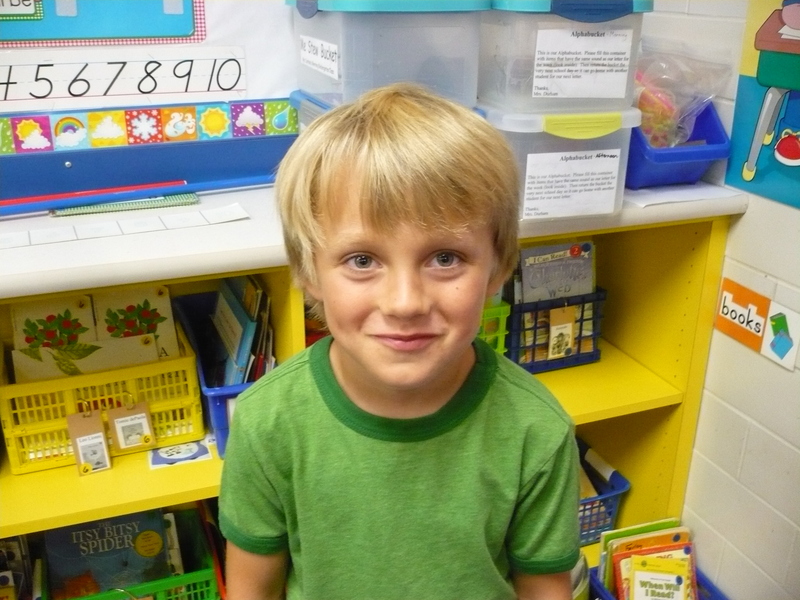 He was fortunate enough to have a few of his soccer teammates in his class. Friday morning he will be headed to his first day of kindergarten. 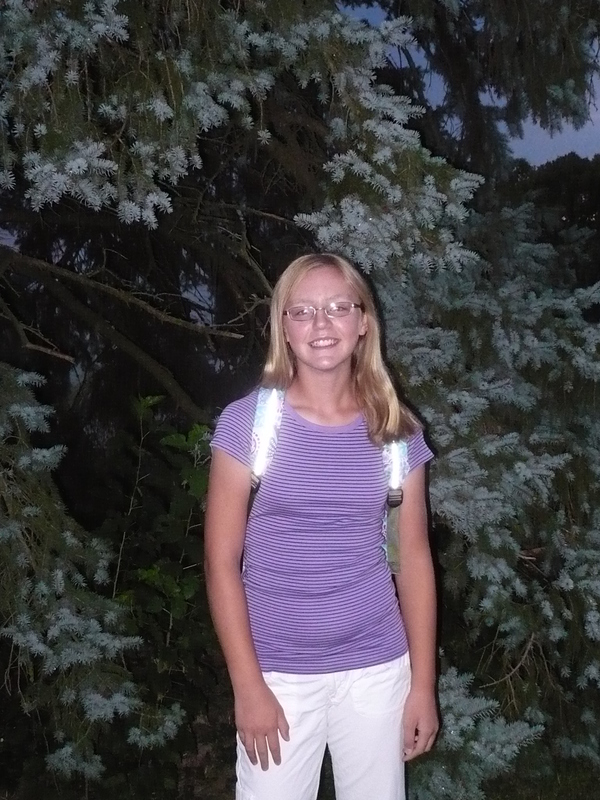 I will be at home bawling my eyes out……..
Today was Kate’s first day of 7th grade. She was up and at ’em at 6:15am and on the bus at a few after 7. She was excited to see her school friends, but sad about not getting to spend the day riding and hanging out with Morgan. Gus had his jumping lesson yesterday, so today was a putsing around day. Jessica put on his jumping tack, and we proceeded to mosey around the arena. I checked him for soundness by doing just a little bit of trotting and cantering, and then Wade and I took him for a nice handwalk around the farm and down the street a bit. Gus ended his easy day by eating an apple and grazing in his pasture. McKinley also wore his jumping tack today. He did well over the crossrails and starter type fences I set for him. I haven’t had the opportunity to jump him since last Thursday, so I took it a little easy on him. Gus is taking up the majority of my time right now, and I have to say that I’m looking forward to pushing him a little harder once I make it through my show in September. He was, as usual, a completely uncomplicated ride. Tomorrow Gus will do some real dressage, and then I will be taking a carfull of people to Cincinnati to look at a potential lesson horse. I awoke at 5:30am. It was 50 degrees this morning, and I decided that Gus could go to my lesson without a bath. He was absolutely disgusting, and I was embarrassed to put him into my trailer. I headed back down 75 south, and reached the farm in time to put in studs and tack up for my 9am lesson. My lesson went really well. I still find it amazing that a simple bit change could make all the difference in the world to how Gus approaches the 2nd and 3rd elements of big combinations. Being able to leave out a step is an absolute necessity at this level, and he is able to do it now with the addition of the new bit. Who would have guessed that his 3 piece loose ring snaffle was too much bit for jumping??!! He jumped around the intermediate stadium course today with ease, and though he felt just a tiny bit back sore, it was great to have all the pieces come together so quickly! 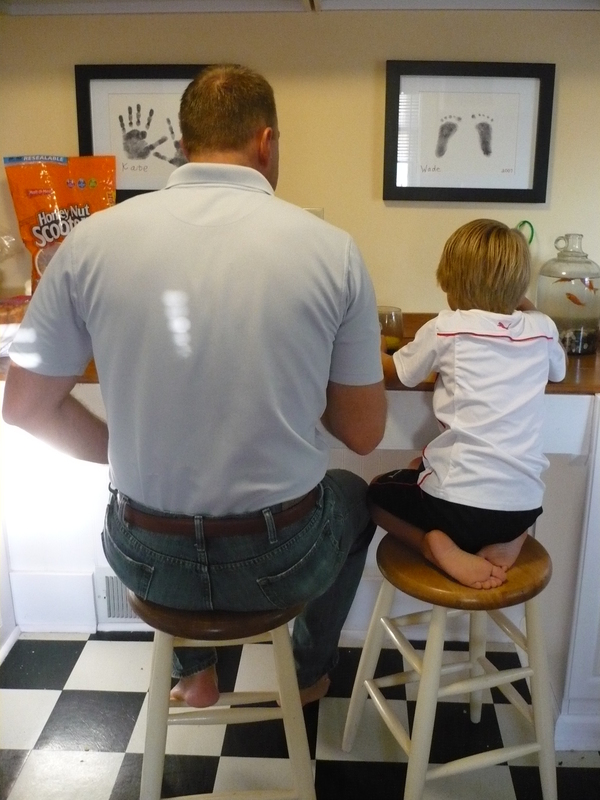 Things went so well that we ended the lesson early so that he didn’t get so much pounding on his legs. Next Monday I will head back to Lexington for my last jumping lesson before the show. The rest of this week will be dedicated to alleviating any soreness, stiffness, etc. from his body while getting him seen by the chiropractor and vet one last time. He’ll get reshod on Monday after we get back from Lexington, and then he should be all set for the horse park. I spent a great deal of time alone in my truck today…..thinking about Dr. Miller. He has been a huge factor in this whole push to make it to Intermediate, and I feel lost without him. He’s the only one who knew Gus and all of his issues. The last 6 years of Gus’s medical history died Sunday with Dr. Miller, and it leaves me just a bit scared and insecure about the next few months of training. I keep reminding myself that God is still in charge, and that the path that lies ahead is not a mystery to Him. 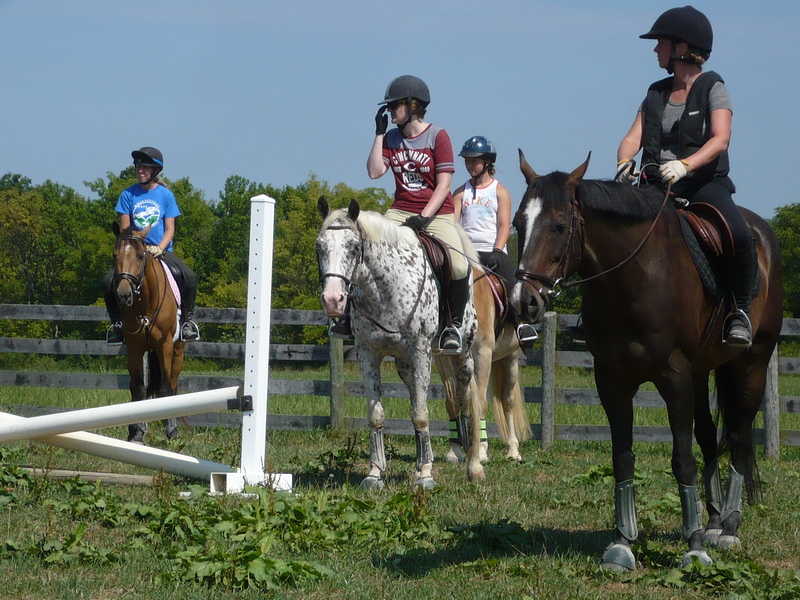 Last week we held “riding bootcamp” here at the farm. 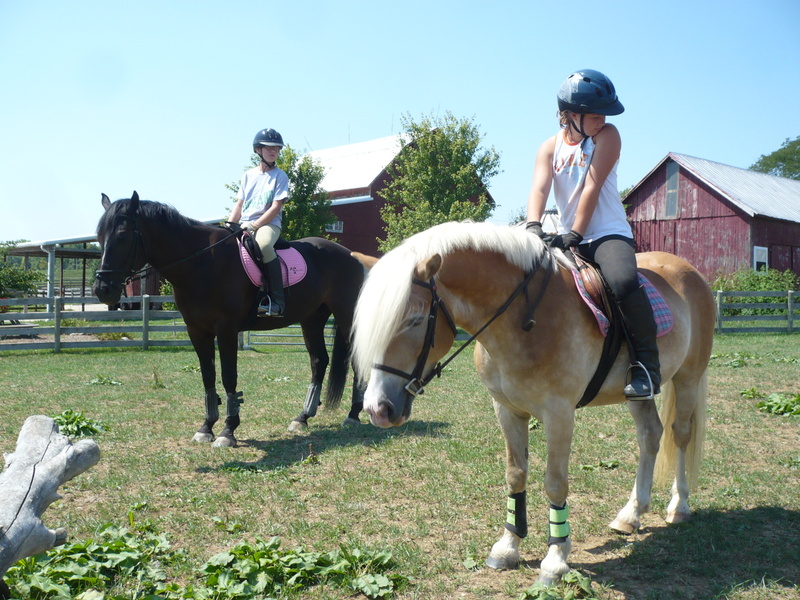 The girls worked on improving their balance over fences, the quality of the trot/canter to fences, and overall course riding abilities. Yesterday I received a phone call from one of my employees telling me that Dr. Miller had died earlier in the day. I can’t describe the unbelievable sadness that came into my heart. He was a wonderful vet and an even better man. Dr. Miller has been an instrumental force in keeping my horses healthy and sound for the last 28 years, allowing me to strive to reach my goals as a rider. He will be missed as a friend, a vet, and a fellow dreamer. What a whirlwind it’s been………………and now I’m 40. Since I’ve last written I have been to Kentucky and back exactly 5 times…..in 6 days. Jeff’s grandma passed away on Monday, August 6th. Not knowing how things were going to be scheduled, I left my lesson on the books for Thursday at 11am in Lexington. When we finally found out the schedule for the viewing and funeral, I decided that it was possible to still make my lesson. Under normal circumstances I would have dropped the lesson immediately and rescheduled, but knowing what was waiting for me on September 1st, I opted to make it work. By 6:45am Gus was bathed. I was slightly worried, however, because his back was really sensitive to the water and scrubbing. I just hoped that he wasn’t too sore to jump. By 7am he was booted and in the trailer on the way to Lexington. I arrived in time to put in studs and make my way up the hill to the jump field. I had a fantastic lesson, and we were back on the highway by 1pm. I pulled in to my driveway a little after 3, threw Gus out of the trailer, mudded and wrapped his legs, and ran up to the house for a shower and a quick change of clothing. By 4:30pm I was showered and in dress clothes. We dropped the kids off at my mom’s house and headed back down 75 south to Kentucky for the viewing. After the viewing ended, we went back to my mom’s to pick up the kids. We were home at around 10:30pm. The kids were bathed and in bed around 11pm. We were back on the road to Kentucky the next morning by 8am. I left Jessica at home to ride my two boys since Gus couldn’t afford the day off and McKinley had a show on Sunday. The funeral went well, and it ended up being a beautiful day. 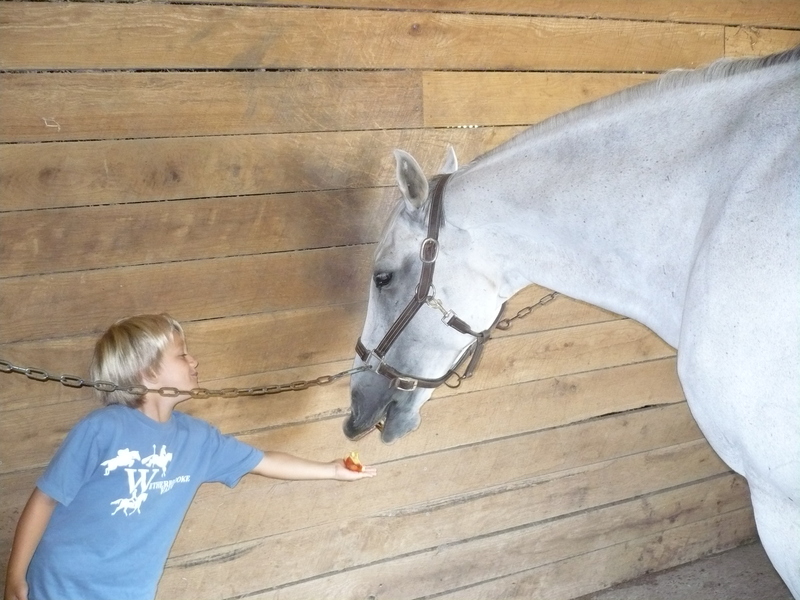 We ate lunch at the church, and were back at home around 2pm…….just in time to meet Dr. Miller at the barn. Dr. Miller flexed Gus and determined that the back soreness was related to muscles and not his hocks. He didn’t feel the need to do hock injections, but went ahead and gave him injections of “p-block” and camphor in his back and also an adequan injection to help keep his joints lubricated. I was supposed to give him the weekend off and start back again Monday. I was looking forward to his 2 days off! At 5pm my kids were supposed to go to my mom’s for a slumber party. My sister was in town, and she wanted to visit with them for the night. Jeff and I dropped the kids off at my mom’s house, and then he took me out to dinner at “El Toro”. I was turning 40 the next day, and although he already took me to Columbus for a “pre-birthday ” night out the week before, we were celebrating the occasion with some dinner and ice cream…………or so I thought. I had a great time visiting with friends and family—except for the part where they put a sombrero on my head and sang to me—- until we had to go. We got home and in bed at about midnight. My night ended then, but for some people the night was just beginning! As I slept like a rock in my bed, several others were sticking 400 forks into my front yard, hanging “honk, Joy is 40” signs on my front fence, draping streamers in my trees, and putting globs of crisco all over my grass. As if that wasn’t enough fun, all of my horses were put into different barns/stalls, my grain cans were missing, my tools were rearranged, and I had a fake lizard hiding in my grain bin. What a fantastic way to start my birthday!! Let’s just say that feeding horses on Saturday morning has never been so interesting! We watched some olympics and went to pick the kids up from my mom’s house. I ended up taking Jessica and Aragon to the reserve with me and McKinley later that afternoon to run them through the creek. We had a show the next day, and we were both slightly concerned about our horses getting through the water complex at Masterson Station. It was the first time I had taken McKinley out on a trail ride, and I was very pleased with how he behaved himself. We all went to bed early that night. My alarm was set for 3am Sunday morning. By 4am we were feeding horses and doing water. By 5 am we had 5 horses in the trailers and were headed back down 75 south toward Lexington. Ike, Cavalier, McKinley, Aragon, and Quinn all did well at the show. It was a crazy day with 2 cross country course walks, 2 stadium walks, and 14 rides between the hours of 8am and 3pm. We were back on the highway. We pulled into our driveway by 7:30pm where we wrapped legs, emptied trailers, and fed horses. I told everyone that I didn’t want to see them until 9:30am Monday. Monday started with a trip to the Tacky horse to buy a new bit, 1/2 chaps, and spurs. Gus was great for his ride, and his back was perfect. McKinley was exhausted after his big show Sunday and was happy to have his day off. I was up at 6am this morning. Gus was bathed, booted, and in the trailer by 7am. 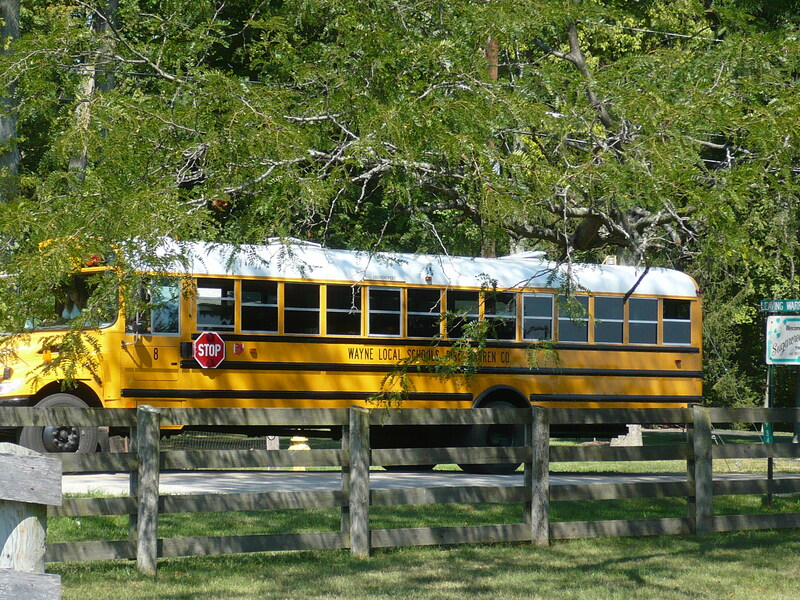 We were back on the road to Kentucky…..this time to Flying Cross Farm for our cross country lesson at 10:30. The lesson was great! The rubber bit made a dramatic difference in how Gus carries himself through the trickier combinations. The spurs were a nice addition and helped with the new “aggressive” ride I am supposed to give him. Gus was mudded, wrapped, and back on the highway by 12:30pm. I got home in time to unload Gus, unhook the trailer, pick up Kate and Wade, feed horses, and have Wade to soccer practice by 5pm. The good news is that I WILL NOT BE GOING TO KENTUCKY UNTIL MONDAY OF NEXT WEEK!!!!!! I will have a stadium lesson Monday, and then I will have one more lesson the week of my show. September 1st is coming soon! By 6:45am Gus was bathed. I was slightly worried, however, because his back was really sensitive to the water and scrubbing on his back. I just hoped that he wasn’t too sore to jump. By 7am he was booted and in the trailer on the way to Lexington. I arrived in time to put in studs and make my way up the hill to the jump field. I had a fantastic lesson, and we were back on the highway by 1pm. I pulled in to my driveway a little after 3, threw Gus out of the trailer, mudded and wrapped his legs, and ran up to the house for a shower and a quick change of clothing. By 4:30pm I was showered and in dress clothes. We dropped the kids off at my mom’s house and headed back down 75 south to Kentucky for the viewing. After the viewing ended, we went back to my mom’s to pick up the kids. We were home at around 10:30pm. The kids were bathed and in bed around 11pm.